Let’s see…. a 4-foot lazy susan shoe organizer……a big “Nike “Just Do It shoe box made out of wood….. and handmade shadow boxes for her husband’s football jerseys. Her requests spark my curiously, making me think about projects I had never even considered before. I mean, who ever thinks of making a lazy susan for shoes?? Instead of shoes, I was inspired to make one, from scratch, for my bathroom! Here’s how I did it. Don’t forget these clever ideas, too! 1. For painting furniture – Just set a piece of furniture on the lazy susan and rotate the furniture for easy painting on all sides without you having to get up and move around. The lazy way to paint furniture! WOO HOO! 2. Decorating or frosting cakes – I can’t even boil water, much less bake and frost a cake. But if I could, I’d totally make my own cake turntable! (….or cheat and buy this cute one from Amazon). 3. DIY sit n’ spin for kids – Yes, this actually works! Much more fun to make one than buying a cheapie plastic one from the toy store, huh? 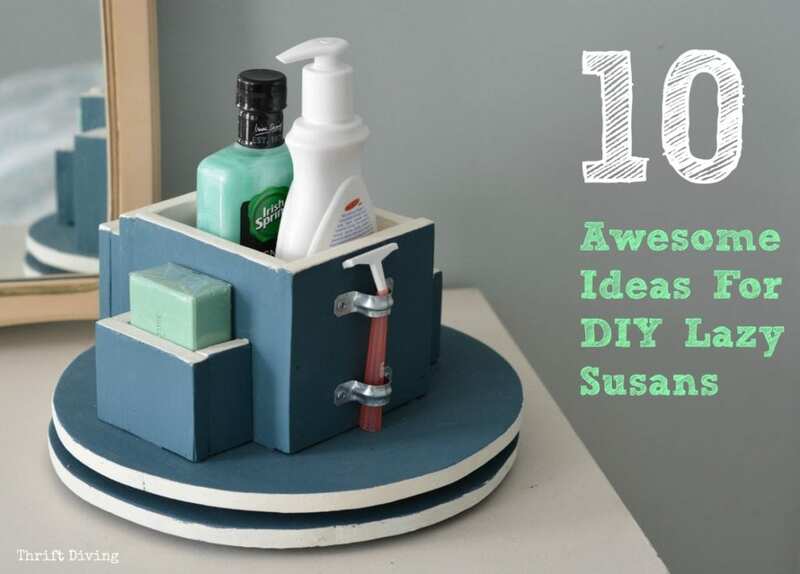 This DIY sit n’ spin is so cute, but I don’t think I could build it quite so elaborate. Mine would be the rejected version :). 5. Plants – Spin them to get sun on all sides, or for watering (thanks to reader, Lisa, for the idea!). 4. Dining room tables – Toss all the condiments or food on them and place in the center. 5. Kitchen & pantry – Stop reaching into the depths of your cabinets. This works better in your pantry and on your kitchen counters! 6. DIY six-pack abs – Stand on a large DIY lazy susan and twist only your lower hips only, side to side, to work your abs. Genius, right?! 7. Inside your fridge – Finally! You can find the mustard! 8. Craft room – Organize all your crafting supplies on top of your lazy susan by gluing down old cans and jars, or joining pieces of scrap wood, to create compartments (like I did in the pic below). 9. For your shoes – Stack a couple large ones on top of each other with wood dividers, just like what my sister wanted me to make for her! 10. For your bathroom vanity – Organize all those razors, soaps, cotton balls, and brushes so they’re not cluttering up your vanity. What other creative uses do you have for lazy susans? Do you use them in your home? Leave a comment below and let’s keep this list going! Love these ideas!!! Your blog is one of my most favorite! It gives me something creative to do with all of the goodies I have hoarded 🙂 YAY! Awww….that means so much, Yvette! I’m glad you love it!!!! I have a L-shaped kitchen counter. I keep my flour, sugar, brown sugar and tea canisters on a lazy susan in the deep part of the corner. They are out of the way but easy to access. LOL, Lorena! How are you?! Your lazy susan sounds cool. Now you must throw some get-togethers! Too bad I don’t live closer. I’d totally come :). And you could totally make one for yourself! Pretty simple once you do it once!